Mark Leone is celebrating more than 45 years in the horse world, but acts as if he just landed his dream job and can’t believe his good luck. He’s a winning grand prix jumper rider and trainer with a reputation for excellence, and it boils down to this: Mark Leone loves what he does. One of the nicest, most cheerful people on the planet, Mark’s enthusiasm is like a tonic: good for whatever ails you. It doesn’t matter whether he’s talking about horses, competing, training, teaching or the show world now and back when he was a kid; it’s all riveting. 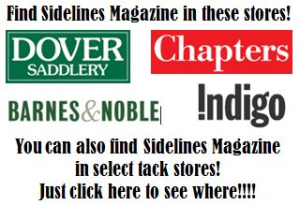 He’s crazy about his wife, Jane; their sons, James and Mark, and how they go full throttle showing spring, summer and fall, then ease back to an easier pace through the winter. He thanks his lucky stars for his horse-loving mother and non-riding yet always supportive father. 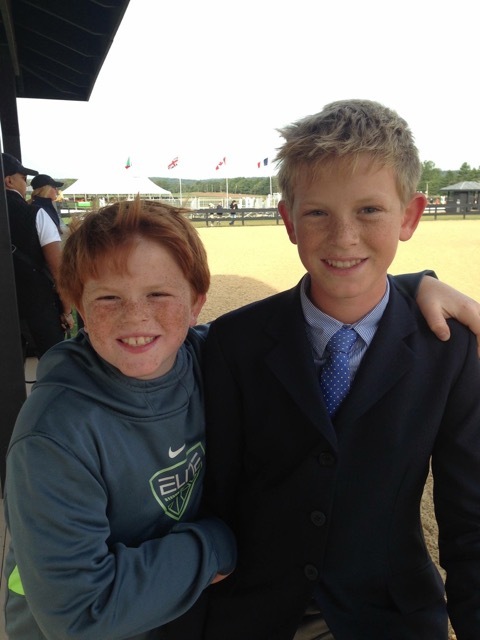 As for early mentoring by Sullivan Davis and George Morris, their lessons still influence Mark every day. Mark competing Loro Piana Karat in Tampa, Florida. In the 1980s and 1990s, Mark and his two older brothers, Armand and Peter, were known as Team Leone, but it all started in early childhood. 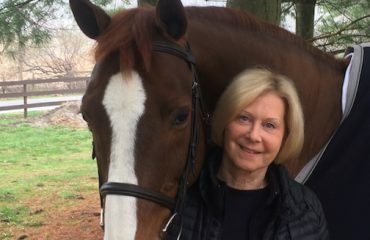 The horsey DNA came from their mother, Rita Girolamo Leone M.D., who grew up in New York City and enjoyed riding in Central Park. Armand F. Leone M.D., their father, had no equine experience, but after they moved to New Jersey, he bought a horse for his wife, boarding it at a nearby stable. Rita rode when she could — she wasn’t alone with her passion for horses for very long. In the late 1960s, the doctors Leone bought a farm in New Jersey, about 25 miles northwest of New York City. 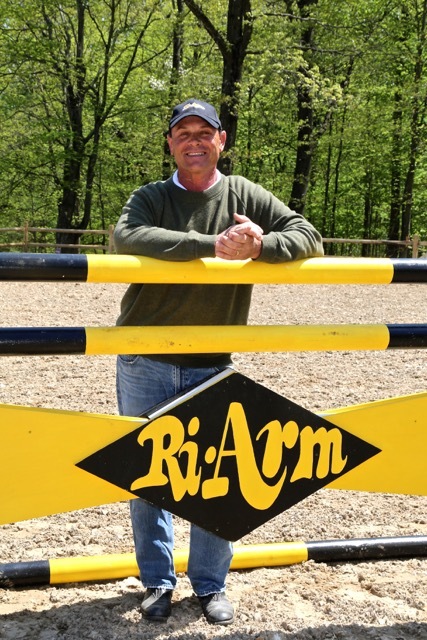 Ri-Arm Farm, which combines their names, Rita and Armand, is where they encouraged and escalated their sons’ equestrian dreams, turning the 15-acre farm into a “backyard” training facility. Mark with George Morris in 1979. Mark won the Medal Finals in Harrisburg aboard Rain Forest. 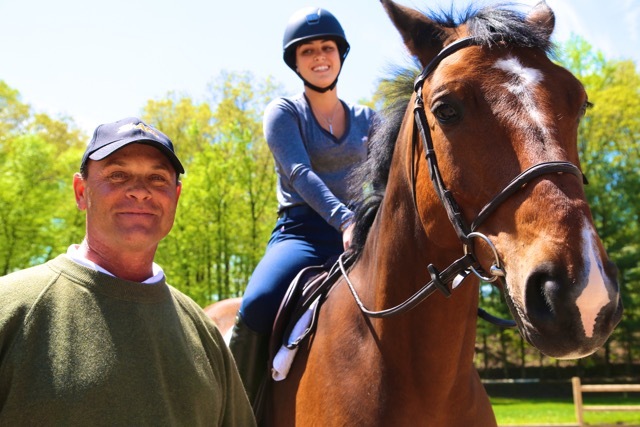 Mark was 14 when the next phase in the Leones’ equestrian education began and they started riding with George Morris at Hunterdon. 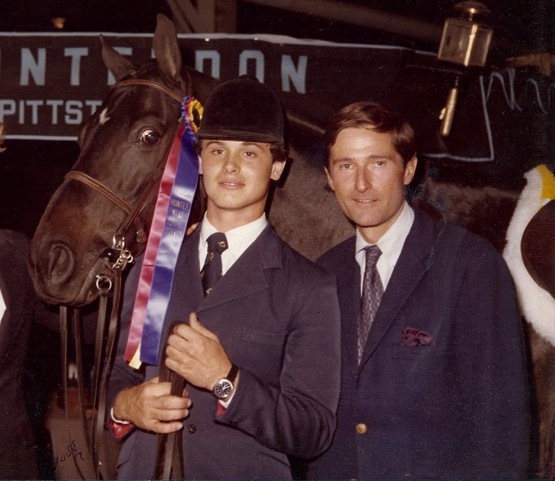 Mark’s junior highlights include being named Best Child Rider at Devon and at the Pennsylvania National Horse Show where he won the Medal Finals in 1979 when he was 17. 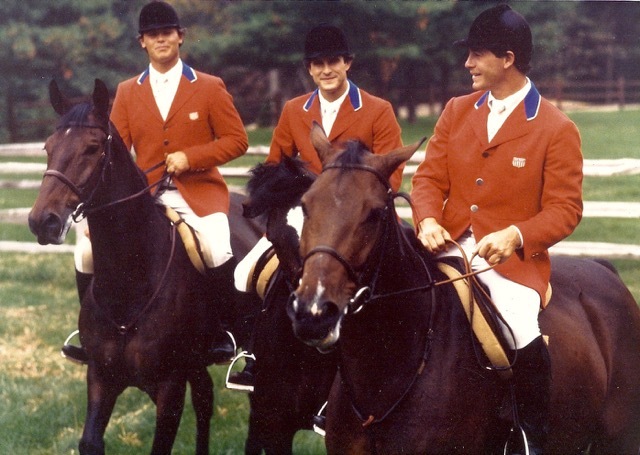 He competed in his first grand prix in 1980, and the following year, when Mark and his brothers were gaining momentum on the circuit, George set the Leones loose on the world equestrian stage. 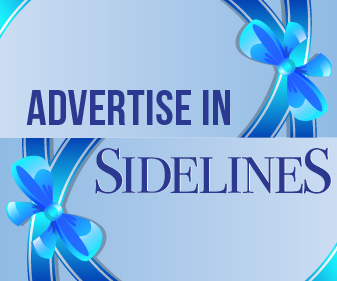 Other influential trainers include Michael Matz and Frank Chapot. 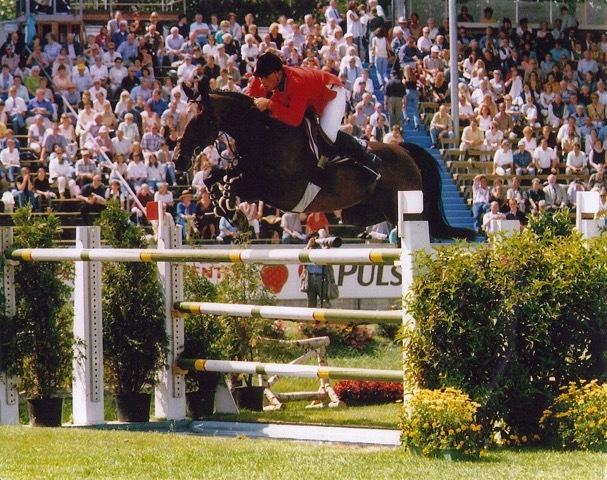 Mark competing in Aachen, Germany, on Loro Piana Casino. Not so long ago, Mark made a list of the grand prix horses he has competed over the last 35-plus years and it totaled 27. That doesn’t begin to include the equines he showed as a junior in pony hunter, hunter and equitation. 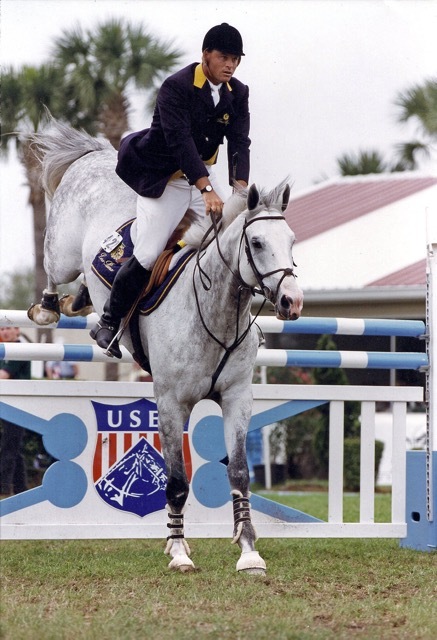 He set his sights on jumpers, competing all over North America and in Europe in national and FEI Grand Prix. 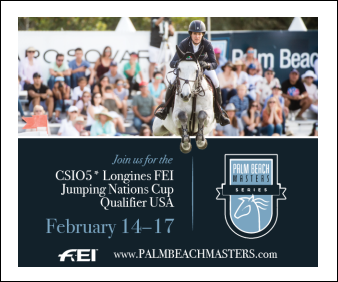 Among his many victories are three Puissance, the high jump class, all of them at the Washington International Horse Show. Mark grew up in the exuberant atmosphere of an extremely active family life whose traditions reflected their Italian heritage. “Sunday dinner was always the best and we had a fabulous family meal wherever we were,” he said. “When we were home, we had a pasta course, meat and dessert and we still carry on that tradition. My father was 90 when he passed away three years ago, Mom seven years ago, and we carry on many of the traditions they instilled in us. They set a great example for us when we were kids, but also now that I’m a parent and an adult. They were amazing parents when it came to opportunity, growth and love. This photo of the Leone brothers, known as Team Leone, was taken at Ri-Arm Farm for an advertisement in American Airlines Magazine. The Leones were raised with the concept that competing comprises far more than the ride in the ring. That competition is the validation of the hard work and day-to-day commitment. “It was also, as my dad used to tell us, a very humbling sport,” recalled Mark. “One day you’re on top, the next you might be at the bottom. It’s a sport that you keep working and working at, because you’re never done learning, you’re never done trying to be the best you can be. Now that I’ve been involved 45 years, it’s still a remarkable game, unique and special. I still have enthusiasm and I love waking up every day to go to the barn. In 1987, while Mark was still very busy on the circuit, he opened his full-service training facility at Ri-Arm Farm. Located in Bergen County, which boasts the highest population in the state, the farm is a 15-acre oasis, co-owned by the three brothers. 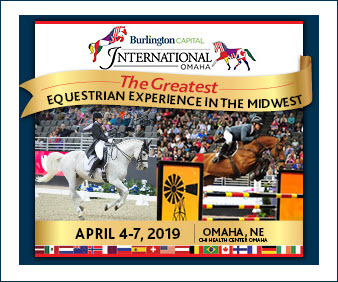 What Armand created for Rita and their sons grew, offering clients an outdoor lighted arena, grand prix field with hills, banks and natural obstacles, indoor arena, 36 stalls, on-site staff and security. 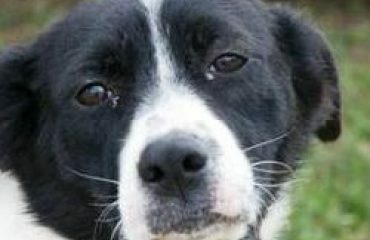 There’s also her work, which she loves. In 2009, Jane and her sister-in-law Alison, Armand’s wife, opened a quarantine facility for Contagious Equine Metritus (CEM) at Ri-Arm. 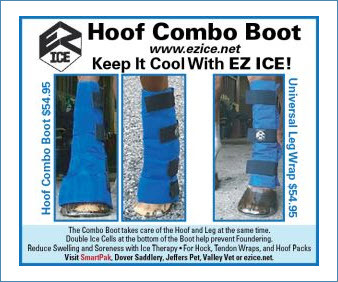 They provide topnotch care during the mandatory two-week CEM testing for mares after their arrival in the U.S. via J.F.K. International Airport. Mark enjoys teaching at Ri-Arm Farm in Oakland, New Jersey. It’s a great dynamic in this high-tech world to work hard doing what you love, but the Leones take the concept to a new level. 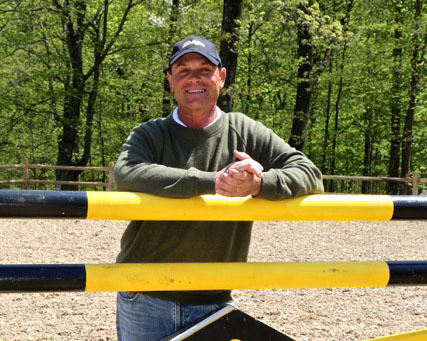 Mark puts back into the sport with his clients, his family, and by serving as chairman of Zone 2 hunter-jumpers (New York, New Jersey, Pennsylvania). In the spring, he took on a new challenge as president of the North American Rider Group. 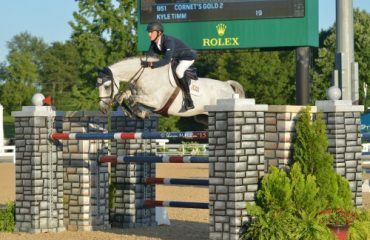 He still enjoys teaching clinics and hopes to have a grand prix jumper so he can get back to the top level of his sport.